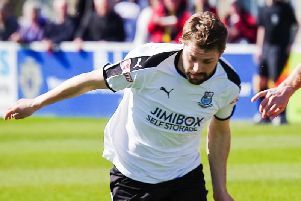 Bamber Bridge boss Neil Reynolds admits he has one eye on next season despite his men still having plenty to play for over the coming months. The Brig boss – who took over as manager at the Sir Tom Finney stadium from Neil Crowe in December – is looking to finish this campaign on a high in both league and cup. Through to the quarter-finals of the League Cup against Ashton United, Brig still harbour an outside chance of forcing their way into the NPL First Division North play-offs. Reynolds will continue to push his men over the remainder of this campaign but reckons it will not be until the start of next season before supporters will start to see the very best of his team. “I’ve always said that I’m building for the start of next season – that’s my target,” said Reynolds. “We will be looking to bring in a couple of new players this season because I want to start next season strong with the squad that I want. “But that doesn’t mean we have given up on this season. “There’s 10 games to go and I want the team to put a strong marker down in terms of how we play to get us ready for the start of next season. “If that means getting in the play-offs then so be it. “Looking at the league table, realistically, it looks unlikely but we’ll keeping pushing on. I want to finish as high as we can. “I want to win the League Cup; I want to win a trophy . Brig have been inactive over the past week after away fixtures against Colne and Clitheroe on Tuesday and Saturday respectively both fell foul of the weather. This weekend, Brig host play-off challengers Ossett Town, who are in fourth spot in the table. Adam Dodd should be back for that game after missing the past two games with a calf strain, while Chris Marlow may be edging closer to full fitness.